If you want to add style and security to your home, aluminum shutters may be precisely what you’re looking for. Our shutters surround you existing covered patio with beautiful, plantation-style protection from the elements, transforming any outdoor space to comfortable indoor haven. Our aluminum shutters are crafted entirely in the United States, using a strong powder coating to ensure you have a maintenance-free product. As opposed to fabric shades or wood shutters, Weatherwell Aluminum Shutters will stand up to our famous Texas storms, wind, hail and sun. However, should you ever have an issue, we stand behind our product with a 10-year manufacturer’s warranty. First, aluminum shutters add beauty to your home’s curb appeal and design. Whether you have a gracious patio or wide balcony, our different shutter designs tie in seamlessly to your home’s exterior with their eye-catching plantation or low-country style. 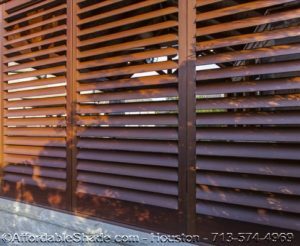 We offer hinged, fixed, multifold, sliding, and Bahama style shutters to suit any preference, as well as several color options. Unlike fabric awnings and other products you might consider, aluminum shutters look as if they’ve always been part of the design. We endeavor to match the style of shutter as well as color to your home, giving you a product that will stand the test of time and add marketable value. Shuttered patios invite you to walk in, explore and relax, giving you the best of both relaxing indoors and entertaining outside. In addition to their beautiful design, aluminum shutters add an extra element of security. Like many homeowners, you likely have belongings stored on your porch such as a grill, television, electronics, and dinnerware. With our aluminum shutters, you can protect your valuables from damaging weather. Our shutters can stand up to high wind and block out rain, keeping electronics dry and light-weight objects in place rather than tossed around the porch or balcony. You can close off these areas with confidence knowing that you won’t suffer avoidable weather-related damage. Additionally, our shutters can be locked securely, giving you peace of mind when at work or away on vacation. You may live in a safe community and know your neighbors, but feel anxious every day when you leave for work, wondering if your flat screen TV or high-end surround sound speakers are safe. Installing aluminum shutters around your porch allows you to lock your belongings, keeping them safe from robbery and giving you peace of mind. Once installed, you will be amazed by how flexible a living space you created. Open the shutters entirely and let in the sunshine and breezes sail into your patio. You will still have the outdoor living space you loved for entertaining or watching your children play in the backyard. Close the shutters, to keep in the warmth or enjoy a storm without getting wet. When closed, they give the impression you’re in a sunroom or merely another indoor home space. You can also adjust the shutter slats to control light and air. Our beautiful, sturdy, well-made aluminum shutters are perfect for any home, whether you’re looking to create an indoor living space and unique appeal to your home’s exterior or keep your entertaining outdoor area safe. You’ll be 100% satisfied with the way Weatherwell products hold up to our brutal Texas weather. Our shutters won’t crack or bend from sun exposure or high winds. You’ll have a unique and flexible living space, perfect for relaxation. Contact us for a consultation, and let us show you how we can customize our products to meet your needs.